1070 Kitchen is a polished company specialising in providing delicious kosher foods to Selfridges, to events, to meetings and to me. You don’t have to be Jewish to enjoy their dishes, but you must have an appreciation of fine foods and fresh ingredients. Each dish comes sealed with a kosher certificate, clearly labelled with serving instructions. 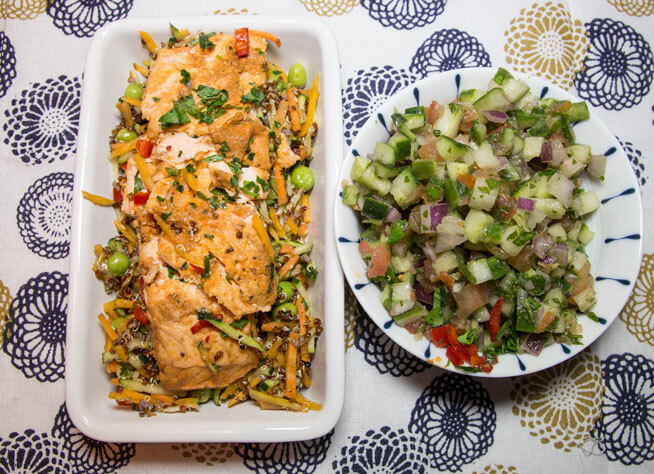 Moroccan Salmon ‘Chrayme’ with Harissa along with Israeli salad was a full and substantial dinner. Both dishes looked beautiful and the taste didn’t disappoint. I will be asking for the salmon recipe shortly, but I won’t be sharing it. The fish was moist, and the flavour was outstanding. Nothing timid or apologetic here. Flaky shards of salmon were as good as one might hope for in any worthy restaurant. A delight! The Israeli salad was fresh, colourful, tasty and could work as part of a summer buffet as a side dish to fish or meat. It had visual impact as well as flavour. It’s been a pleasure to taste 1070 dishes over these past weeks. This company pays attention to detail and that must be an important factor in the consideration of religious sensitivities. But let’s not forget that ‘Jewish’ food can be for all of us – as it long has been in this country! Think of our very English fish and chips: it’s thought actually to be a combination first sold by a Jewish immigrant! I have loved 1070 soups, fish, meat and salads and will likely swing by Selfridges a little more often in future!